Over. A whole book on knitting OVER the edge. 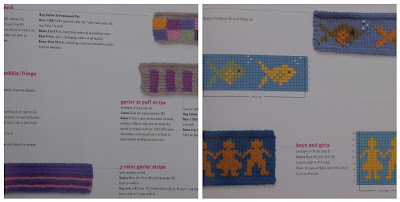 The second collection of decorative borders by Nicky Epstein. So many ideas for creative borders. I love how this book is divided into sections. And, all color coded for that section. It really is so pleasing to the eye. All showcased in lovely red and orange and peach. This is probably my favorite section. Such cool cords! I think it would be so cute to make a hat and put a bunch of that cord fringe around it. Oh, except along the front. That might be annoying to have that fringe in your eyes. And, I love those circles. If you have a fear of color. Fear no more. And there are charts for just about everything. Dogs, cats, hearts, flowers, bunnies, ribbons, butterflies, moons, suns, snowflakes, stars, ducks, fish, animal print! Yep. Totally new and different. This section has some really cool and funky borders. Endless possibilities. I have two of these books to give away. If interested, please leave a comment here by Monday the 11th at 12 p.m. I will have the random generator choose a couple of numbers. What a great resource! I'd love to win one! Wow, creative ideas there and lovely photos that show the borders off really well. Thanks for the chance to win! Wow! Those designs look awesome! I love Nicky Epstein's work, too. Hmmm... yes, I, too see baby girl sweaters with LOTS of decoration in my future! Yeah, I've been coveting that book for awhile now. I really love the flower section. Wow, very cool book! I really love how seeing these has generated some new patterns ideas! Oooh this book looks lovely! Oh my yes, I want a copy! Thanks for featuring the book. That's one of my favorite things about knitting blogs. I get introduced to so many designers and yarns that I never would have seen otherwise. So pretty! I'd love to win one. I have so many friends having babies, and a cute, simple sweater or blankie with a pretty edge is always a great gift! Never been much into borders, but a couple of those definitely caught my eye. I've never tried these kind of embellishments! Thanks for the chance to win! What a great book. I'm expecting a baby and was just looking into edgings online to make some classic baby sweaters pop. Thanks for being generous and having a giveaway. Ooohh that would be wonderful to have!! what a wonderful book. It looks full of great ideas and inspiration. Would love to win it! Another of your gorgeous giveaways - how fantastic! I'd love to own this book - thank you for a great blog. I absolutely love the options Epstein presents! How creative! I love it ! Enter me please. Are you kidding me!! I love the borders and the circle flowers...well!! Finally something that excites me and distracts from this awful weather. To win one would be divine lol!! Love her books and love your blog! Thank you! i love the cords and the colors! how fun! Oooo! I'd LOVE to win that book. Please pick me! 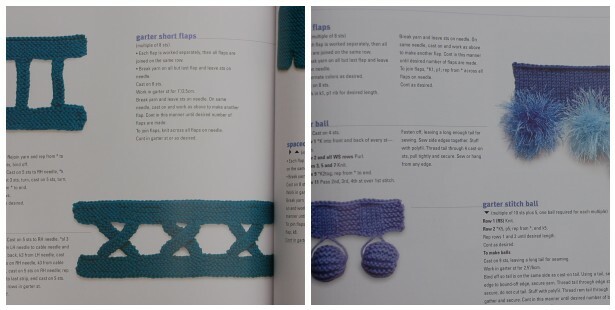 So many neat ideas, this book looks like a must have for every knitter!! Oops! That anonymous one was me. I'd LOVE to win that book. Please pick me! Thanks for a sweet contest! Would be a wonderful resource for the knitting classes I'm now teaching. Thank you for the opportunity! It has been very entertaining to read your blog. That books looks awfully inspiring!!! I'd love to be in the draw to win a copy! Best wishes, from Hayley. I have 'Knitting On the Edge', but not this one...lovely, sign me up! Hell, if I don't win this book, I have to buy one, because my hands started to itch the moment I saw the first photo!!!! Wow, what an inspirational book! thank you for sharing your copies with the lucky winners. Love your hat idea, made me think of the headwear in "Cleopatra." I love her stuff it is all so cute! This book looks like tons of fun! Thanks for offering it as a giveaway! Oh, that would be great. Then I wouldn't have to keep checking it out of the library! I would LOOOOOOOVE to own this book!!! What a resource!!! 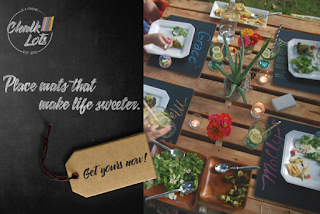 I have big plans to start designing my own projects this summer... it would be super handy!!! What fun! This could totally revolutionize my knitting! This looks fantastic! Thanks for posting. I have Knitting on the Edge, and I really like it for inspiration. I don't really need the book, so give it to someone else! I'd love to have that book! So many new idea's emerging! The colors of fabulous in this book. As you said very pleasing to the eye. I have a grand daughter that would love so very cute in any of those pattern ideas. The woman is a genius! So much inspiration to be found in books by Nicky Epstein. Loving those cords too. I have had several of these books on my wishlist for quite a while now. I'd love the chance to win this one! Thanks! I have been longing for her books for ages, and would love to win one. Thanks so much for offering this! What fun! I agree - the circles are awesome! Yey! I want one! Thank you! Ooh! pick me! pick me! I have a place on my bookshelf all ready to fill. what a beautiful book! I love all of Nicky Epsteins books so I am sure this is fantastic. I would love this book! I can honestly say I have never seen knitting like this before. So creative! You are very generous and I love your blog, too! Why don't I have this book already?? Thanks for the chance to win! 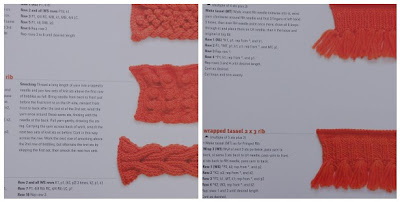 What a fun book to have in a knitting library. I would love to win this book!Thanks for the great giveaway! Ooh - I've borrowed this from the library. Loved it. I have many girls to knit for. This book would be a great addition to my library. Wow!!! I'd love to use this book !!! WOW!!! I'd love to use this book!! Love her work. Thanks for sponsering the give away. PLease, yes, I'd love one!!! Wow! There seems to be so many things in that book! The appliqués section looks so beautiful! Thank you for the contest and have a great weekend! 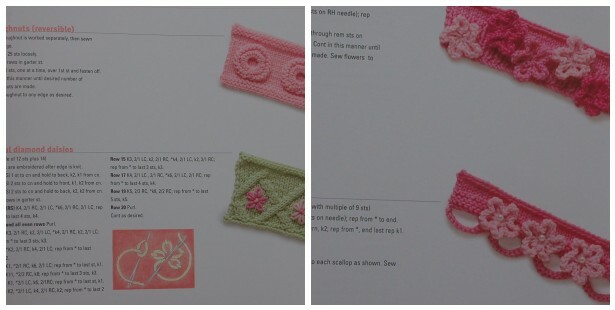 I have her Knitting On The Edge book and it's just gorgeous. I'd love to have her Over the Edge book! Oh my goodness! What an awesome book, I want this! Love Nicky's books have several of them. Thanks for the opportunity to add another one to my collection. That book looks stunning! Thank you! I've always loved Nicky Epstein's work. She's incredibly talented and I'd love to win one of her books! Thanks for the chance to win, I've admired this book in the bookstore many times. I love Nicky Epstein's books and would love to be entered in your drawing for this one. Thanks! Giving it another try! Thank you! Thank you for this chance to win a beautiful book. Very nice! What fun looking ideas. Thank you! Looks like a useful and eyecandy-full book! Would love to have a copy of the book-thanks for the give-away. I love this book. Every time I go to the bookstore I thumb through it, there have just been other priorities! Yay! Great and inspiring book! this looks like really neat book! i'd love to have a copy! wow what a stunning book, would love to have a go at some of those projects! Those appliques looked amazing. I would love to check this book out. Thank you for showing it to us and offering it as a giveaway. 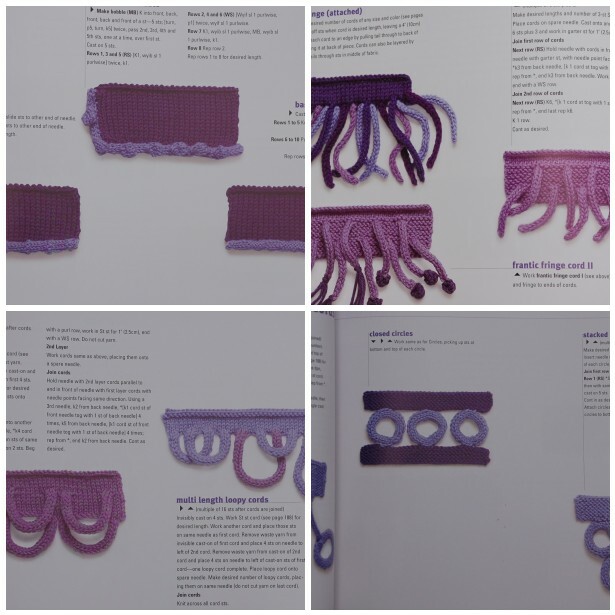 I have often been curious to try some of the techniques in this book now that I'm getting a taste to try designing! How fun would this be to have! This book looks amazing! The charts give so much freedom, and those cords. Yes, please. 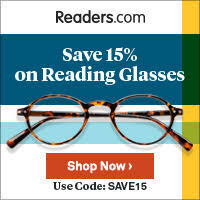 what great books! just some of those pictures look intimidating to me! I've been eyeing this book at y LYS the last few weeks. It is so on my wishlist. I haven't heard of this one. I do have, "knitting on the edge" and "knitting beyond the edge"
I love Nicky Epstein designs. I love to add trim to things, especially scarves. Thanks for the offer. I would love to win one of the books. Those look like wonderful books. Where would one begin? What a fabulous book! What unique ideas! You could really go crazy with color & shape. I'd love to explore this book & try some! Thank you - the book looks amazing. How wonderful is that?!?! I have to admit I haven't really thought of edges until now! How wonderful! I have to admit I'd never thought about edges until now! How wonderful! I have to admit I haven't really thought of edges until now! Sorry....the comment page keeps screwing up and I can't tell if it's worked or not!!! Oooh, I would love to win, and I agree, those cords are great! I always love Nicky's books. Hope I get her latest. All Nicky's books are fabulous.Sue. I thought that I probably didn't need this book until... what about trim around decorative pillows. I guess I could need this book!!! That book looks so fun. Thanks for the give-away. Thank you for the nice book review, I just love her books...this looks like a fabuous one for the library, lots of new techniques. Oh my gosh...I love all the books you turn us on to...but this one looks like my fave! Thanks for giving us the chance to win it! Thanks for the chance to win this book and your review! One of the books I've coveted for years...thanks for the contest. I'd love to have this book! So many great ideas!!! Interested right here! 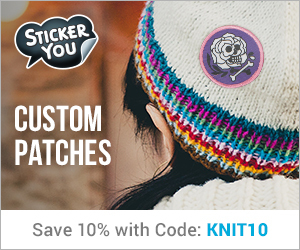 I love adding touches to my knitting to make them unique and mine. Nice post with beautiful photos. I hope I win this. So many choices. I like the circles on the edge. They kind of remind me of roses. Thanks for showing the pictures in side the book. This book looks amazing and it would be awesome to have! Thanks for the giveaway! I too love the cords. I imagine a wrap with wonderful dangling cords. They'd swish when I walk. Fun! I'd love to win! Hi Leslie, I have had Knitting over the edge out from the library and it really is a great book. The edgings are easy to make, I was surprised!!! Nicky has more books out too that are great. Kind regards, Anita. Yes, I'd love this! Thanks for the opportunity! Very cool. I'm always intriqued by her stuff, but don't have any of her books. What a great book! Taking knitting to another level! Beautiful book, I would love to win! WOW - that looks like an incredibly useful book and tons of fun, too !! oooo - lovely! thanks for the chance! I saw this book at the library last week and it looks fabulous! Oooh, so much to learn! Waving both arms wildly here! Edgings are so much fun, and can completely personalize a knit! Great finishing touch. Great book! I must admit I'm a little intimidated by some of those techniques but they look fun and the results look amazing!! I absolutely LOVE this book and would love to add it to my library!! Wow, that book looks fantastic! Please count me in. I absolutely LOVE this book and would love to adit to my library!! Amazing and inspirational! Yes Please!! 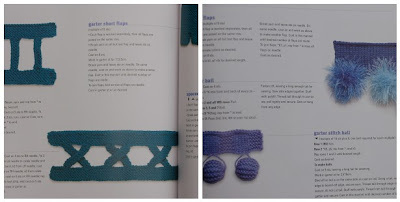 I have Nicky's first book; Knitting on the Edge, and would love the companion book! What a grea giveaway, thank. Nice book! Thanks for the opportunity to enter and win. Wow! Great book! I especially like the icord scarf. Usually, I make my own patterns, but I would use these. I have her companion book to this one, Knitting Beyond the Edge, and it's inspiring to look at also! I think she's a genius with embellishments. Love to have this book, too! Some very cool idea's, love it! And would be thrilled to win one! Very cool. I would love to win one. I believe that you can never have too many knitting books! Nicky doesva great job with finishing touches, doesn't she? Thanks for the peek into her book.